Farmers Markets: Building Businesses & Helping Communities highlights results from the 2015 Farmers Market Managers Survey. The full report of the data will be released later this year. National Farmers Market Week is the perfect time to reflect on the evolution we’ve witnessed in our nation’s local and regional food systems, and to celebrate the results of the public and private partnerships that have made success possible. The local food sector represents more than $12 billion dollars per year in sales, according to industry estimates. That’s a lot of economic growth and opportunity for American producers and businesses. 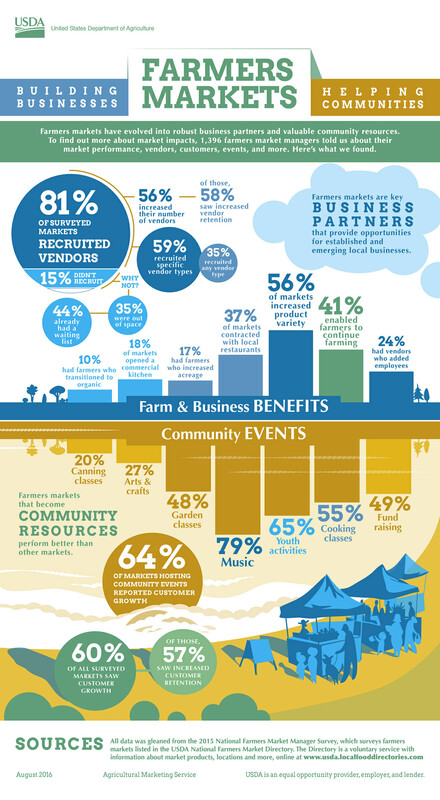 And, in the newly-released results of the 2015 survey of nearly 1,400 farmers market managers, we are able to see the direct benefits these markets provide to businesses and communities across the country. For farmers and food businesses, the survey conducted by my agency—USDA’s Agricultural Marketing Service (AMS)—shows that 56 percent of markets were able to increase their product variety because of vendor recruitment and market growth. Another 37 percent were able to contract directly with local restaurants to have their vendors supply fresh ingredients. The survey results also illustrate the critical role that farmers markets serve for rural communities, with 17 percent of markets reporting that their farmers were able to increase their farm acreage due to participation in local markets, and 41 percent of markets reporting that the market enabled their local farmers to continue farming. We also saw evidence that communities are benefiting directly from markets that combine vendors with hosted events. In fact, 64 percent of markets hosting community events reported customer growth, with another 57 percent reporting increased customer retention. Hosted events included a wide variety of educational and recreational activities—such as cooking classes, live music, gardening classes and children’s activities. Markets that mature into a multi-faceted community resource perform better than markets that don’t—showing that a path to continued success is a blending of rural products and responding to community needs. Local food is not a trend. It’s not a fad hooked to a priority that will fade away. Local food is bigger than any one individual, bigger than policy documents or informational campaigns. It’s a vital part of our nation’s diverse food system, born out of consumer demand and driven by the universal connection we have to our community and the farmers and businesses owners who produce the food we eat. Long-lasting connections are being forged between farms and consumers, and USDA and AMS are helping. In the last two years alone, USDA has made over 900 investments in local food infrastructure that connects farmers with local markets, including food hubs, warehouses, local processing facilities and distribution networks. Over the course of the Obama Administration, we’ve invested close to $1 billion in 40,000 local projects—from small loans of a few thousand dollars to local farmers, to multi-million dollar grants for infrastructure development. We know that these investments will help farmers markets and local food systems continue to serve their communities. And this week, we get to celebrate everything that this support—coupled with community passion and private sector innovation—makes possible across the country. Happy National Farmers Market Week!